Redland City Mayor Karen Williams today announced that stage one works for Council’s Weinam Creek redevelopment project, which will ultimately transform the waterfront of Redland Bay, will commence later this year. Cr Williams said stage one would provide valuable infrastructure for the community, including ground-level car parks and a footbridge connecting the Moores Road site to the Redland Bay Marina. “Residents have told us they want Weinam Creek upgraded and we are working to help meet the high demand for car parking,” Cr Williams said. 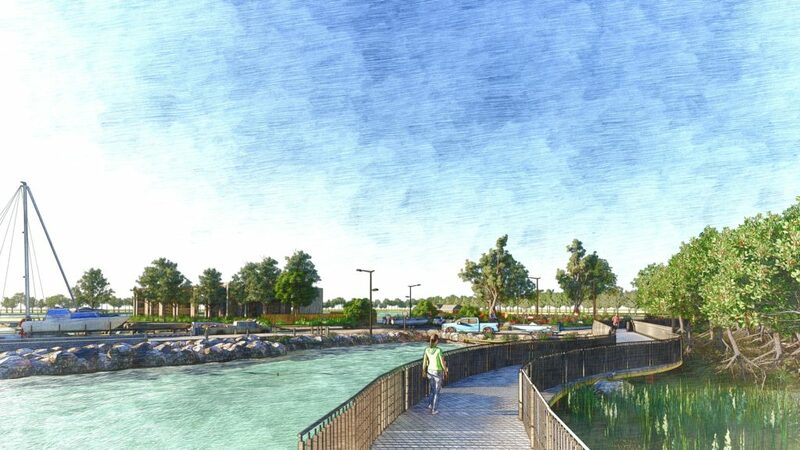 Cr Williams said a footbridge would provide more direct access to the marina, accommodating foot traffic and bicycles as well as mobility scooters. Lighting and other security measures will be incorporated as part of the design process. Plans for future stages of the project include additional ground-level car parks, secure car parks and multi-deck car parks within the Redland Bay Marina precinct. Stage one will also include site preparation for future residential dwellings, including nine house lots fronting Moores Road and a one-hectare lot with potential for medium-density development. Council-owned subsidiary Redland Investment Corporation will work with Council to develop stage one of the PDA project. Other features of the plan include improved drop off and storage facilities for Redlands Coast Southern Island residents, more than 21,000sq m of new open space, the rejuvenation of 46,920sq m of existing parkland, new pedestrian and cycle ways and construction of a new boat ramp. There will also be mixed use and medium density residential development and retail and commercial amenities, including cafés and restaurants as well the potential for a health precinct for mainland and island residents. Cr Williams said the project provides a valuable opportunity to showcase Weinam Creek as a community focal point and a regional gateway to the islands as well as creating jobs and supporting economic development within the region.